Project "Get my printer printing reliably"
I've been frustrated by my Felix 3 Printer for several years. It appears it requires a baby sitter to print reliably. I'll be updating this thread with my efforts. Re: Project "Get my printer printing reliably"
as an example, the image below is a recent piece of a failed print. Ignore the roughness at the bottom, thats where I removed some supports. The main issue is the patchy printing thoughout the print. Another example from the same project. Does your printer's extruder have fans attached to it? this could help with layer adhesion and webbing. three of us have the same printer. It comes with a hot end fan and left and right cooling fans as it extrudes. Phillip brought it along last meeting and found that the extruder drive current was out. A tweak later on the motor drive current and it was working well. Yes, Thanks for the help, I'll need to find some time to update the thread. 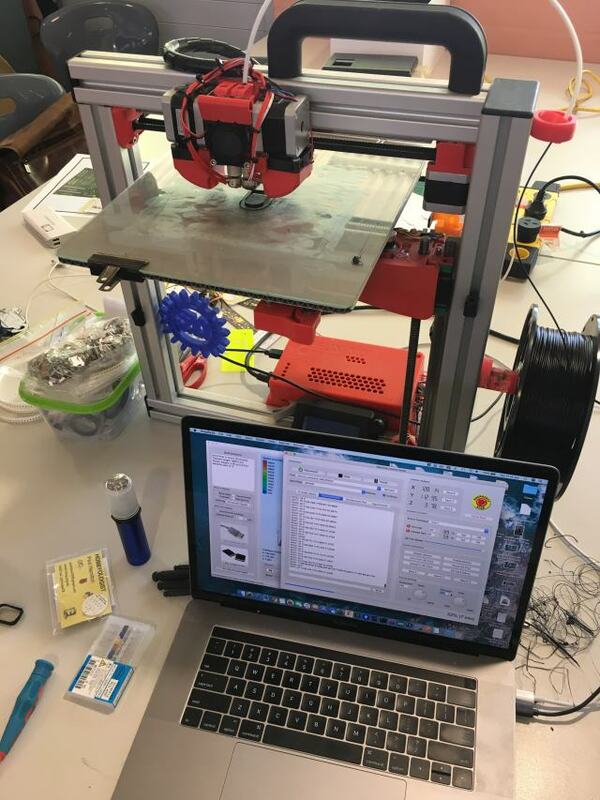 So I took my Felix 3D Printer along to the February South West Makers meeting st the Eaton Library. I had been speaking with Stephen about it at the December meeting. A couple of quick test prints and Stephen, Paul and Rob were onto the problem quickly. The problem was under extrusion and while printing we were easily able to stop the flow by holding the filament back and hearing the infamous "click". We checked the tension on the print head but that was up as high as it would go. Stephen then hit the jackpot. The current delivered to the stepper motor was insufficient to push the filament through the head and the stepper motor was missing steps as a result. A quick adjustment to the driver on the control board and the print head was extruding filament like a champ. When I returned home with the printer, I still had a few issues. Immediately, I had issues with serious under extrusion. I had to revisit my slicer settings in Simplify3D. During my troubleshooting I had made changes which had to be reconfigured. As it was under extruding again, I tried upping the extrusion factor to increase the flow of filament. This has the opposite affect to that which I was expecting. Extrusion almost stopped all together. I finally worked out that the drive gear was actually moving too fast and was gouging the filament and not pushing properly. I reduced the extrusion back to 100% and I'm now printing my first complex item in several months. I have manually reduced the flow rate down to 90% during this print after a couple of under extrusion issues and the print appears to be coming along nicely. Has anyone had any experience using CURA with their 3d printer? Just wondering. Last edited by DJCoopes on Tue Mar 19, 2019 4:35 pm, edited 1 time in total. Has anyone had any experience using CURA with their 3d printer? I haven't had any experience with it but I will soon be looking into it as it's the inbuilt slicer in the OctoPrint. Which, by the way, is the reason I need my printer printing reliably, I want to be able to set it and forget it during prints. A lot of us use Simplify3D: https://www.simplify3d.com/ but experimented with OctoPrint a few years ago. Well it seems like I’m getting somewhere. Vaze printed in “vase mode”. Looks almost perfect. Looks great form the picture! Does it hold water? I was trying improve my top layers. I have always been a bit stingie on the infill and normally print at about 20% infill. Today I tried 30% and found a great improvement.